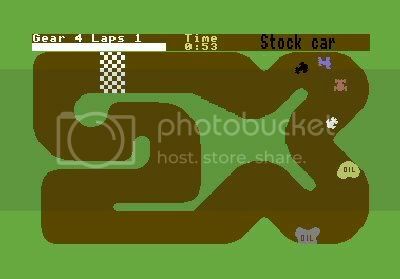 by PaulEMoz in "Commodore 64", "Stock Car", "Super Sprint"
Jesus. Would you look at the state of that? I mean, how on Earth could that be worth more than two minutes of anyone's time? That was exactly what I thought back in about 1986, when I went to a mate's house and he was loading games from a tape and this came up. And then we played it. And at the end of the night, when it was time for me to go home, we hadn't got any further through the tape. And it was a C90, too. I'm guessing you haven't played Stock Car. Even if you had a Commodore 64 in the 80s, and even if you bought, stole or borrowed hundreds of games, it wasn't exactly a well-known or common game. If, by some chance, you did stumble across it, you probably thought exactly what I did when I first saw it, and went on to something else. If any of those things applies to you, that's a shame. It's a shame, because Stock Car has a lot of options and a two-player mode. Once you start messing with the options, changing the amount of skid or oil slicks, you can make the game a lot of fun. Two-player is unquestionably where a lot of that fun is though. If you can play this with a mate, you'll be playing one of the most entertaining Super Sprint-style games of the era. Seriously. Stock Car is definitely a perfect example of graphics not making the game. A perfect example of an unsung classic. And if you do play and win the race, watch out for the trophy ceremony. Un-be-lievable.